“I saw a thing, actually a study that said: speaking in front of a crowd is considered the number one fear of the average person. If your heart starts thumping at the thought of speaking in front of a group of people, as Seinfeld aptly points out, you’re not alone. After more than 15 years, I can tell you that the adrenaline rush of public speaking never fully goes away. However, that’s not necessarily a bad thing. That adrenaline can be used as fuel to deliver a powerful presentation. Plus, there are some simple tricks and techniques you can learn from magicians that will reduce your anxiety and raise your confidence. This is especially true when you speak in front of a group. It’s not what you do, it’s what people think you do. How the audience perceives you has a tremendous effect upon how they will hear and implement the information you’re presenting. Magicians study to understand how the brain works so they can influence your perception and artfully fool your mind when performing magic. While a magician never reveals how he performed his tricks, I can let you in on some powerful secrets of human behaviour and showmanship that we study in order to become a captivating public speaker. What type of presentation are you giving? What are the organizer’s goals for their event? Is there a theme? Is this just a quick status update for your team or is it a keynote address to your stakeholders? Who are the participants? A talk designed for construction workers may be very different to a talk designed for the C-suite. Find out as much as you can about the participants. 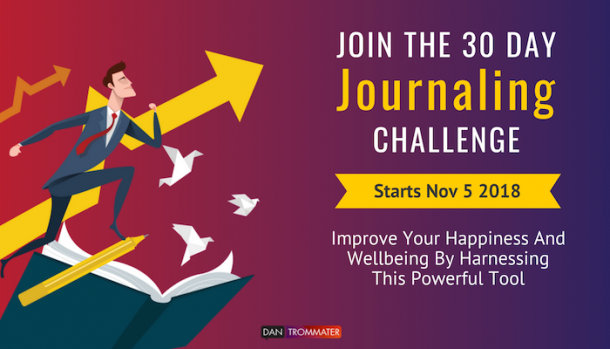 What are their challenges, pains and goals around the subject matter? This will help you understand your audience so you can design your content to take them from where they are to where they want to be. You have to help your audience see they are dissatisfied with where they currently are, so you can open their minds to the possibility of where you want them to go. What do they want from the presentation? By understanding their objectives, you’ll understand what they’ll consider to be a successful presentation. What do you want the audience to feel, think or do as a result of the presentation? What experience and information do you need to share so they can reach this goal? Another factor to consider is whether people are attending by their own decision, or if they are required to be there. Someone who is excited to see you present will behave differently than someone who is being forced to listen to you. My approach is two pronged (and contradictory.) I assume that no one in the room wants to be there, AND I assume that they are all really excited to hear me speak. By assuming an indifferent audience, I am forced to create as compelling a presentation as I can. I want to transform a group of resistant people into excited supporters. On the other hand, I’ll also assume that the audience has chosen to spend their valuable time with me. This creates an energy and enthusiasm within my mind that is contagious. I think, “they’re excited? Great! I am too!” As an audience member, it’s much more fun to watch someone who is really excited to be there. Whether you’re delivering a welcoming address at a conference, a sales team briefing or the yearly profit report, you have to be compelling. You have a mission – get these people to embrace your content. If they aren’t paying attention, it doesn’t matter how valuable that content is. If you want them to listen, engage and learn, you must present your content in a compelling manner. A magician designs a show by taking the audience on a journey. A poorly designed show will just be a series of tricks. To get a standing ovation, you need to create a mesmerizing story that keeps them on the edge of their seat. By the time I’ve finished designing a program, there are usually only 2 or 3 main points I’m trying to share. People don’t learn if they are overloaded with too much information. Think about what the most important high level points are and then build around them. In my hour-long keynote addresses, I rarely make more than 3 big points. This seems crazy. How could you fill an hour with only 3 points? The answer is to hit those points many times in different ways. 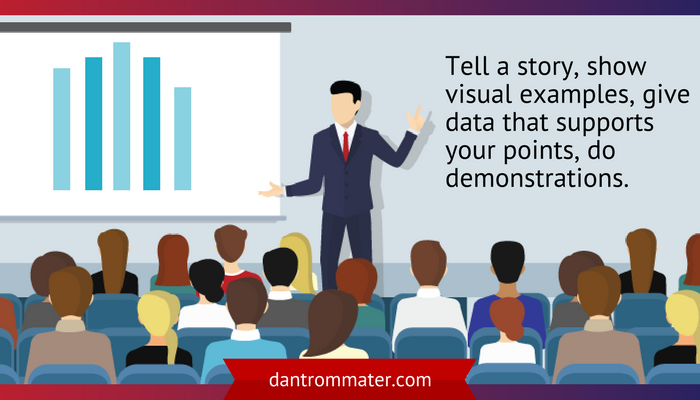 Tell a story, show visual examples, give data that supports your points, do demonstrations. Different people learn in different ways, so be sure to deliver the information in different ways. Presenters often overuse powerpoint, especially when they rely on the slides to deliver the information. This usually happens when they haven’t prepared enough, they are cramming too much information in, or they are nervous. They’ve made the presentation about the slides, instead of for the audience. Slides can make or break your presentation. If you stuff the bulk of your script onto slides, the audience will read them quicker than you can speak. This makes what you are saying redundant and gives them an opportunity to tune out. If you can get through your presentation without slides, do it. If they are essential, use them only to demonstrate with images, quotes, charts or high level points. Design them with the audience in mind, not you. No one enjoys death by powerpoint. To make a truly engaging presentation, use other visual aids that are interesting and tell a better story than slides. In my case, I use magic tricks and optical illusions, but you can use whatever is appropriate to you and your content. Do you know how many times a magician has to practice a magic trick before it can be flawlessly executed in front of a room full of people? If you want to look natural, polished and confident, practice your presentation until you know it so well you could deliver it backwards. You’ll be able to better connect with your audience because you are relaxed, plus, when you have the safety net of a script, you can make jokes and improvise. 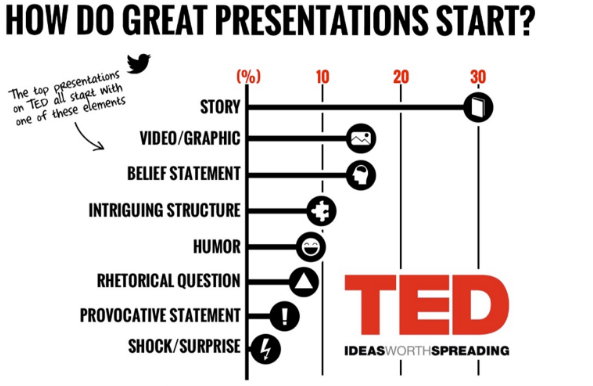 When delivering a presentation, giving the talk itself takes the least amount of time. 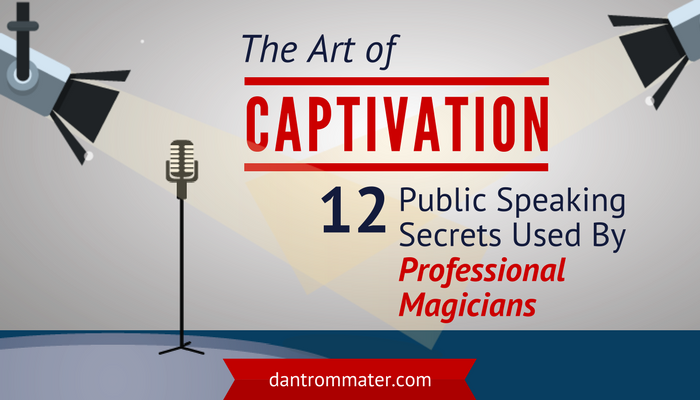 Careful preparation and ample practice are key to delivering an amazing talk. Depending on the length, complexity and importance, it can take days, even weeks to create, practice and refine. For example, I took months to prepare for my TEDx talk. I had to decide what I wanted the audience to feel, think and do as a result of my words. Once I decided on the impact I wanted to make, I had to craft a script and choreograph the words with the magic tricks. I practiced the talk dozens times, both at home and in front of family and friends. All this preparation helped me shine in a one-time opportunity. One sure way to be thrown off your presentation game is to have a technology malfunction. So many presenters overlook the crucial details of room layout, lighting and the other technical elements that help support the creation of a compelling presentation. Where in the room will you be presenting? What is the lighting like? Will everyone be able to see you? What sound equipment will be used? Do you need a microphone? Will there be a spare mic, or batteries available? If you are using a computer for slides, can you use your own computer? If not, will you have a chance to test running your slides before the presentation begins? Before a session starts, I make a conscious effort to meet as many people as possible and give them a good experience with me. I make eye contact and generally try to establish some element of trust before I even start working. This makes getting up in front of the room easier, because you feel like you already have friendly support. It also helps people focus on what you are saying because they already like you. When you start, the opening of your presentation is very important. You want to hook the audience in immediately. Slideshare has a great article on their blog about the most popular hooks used in the Top 100 TED talks. Story – sharing an experience, making you more relatable to the audience. Video/Graphics – images can sometimes better convey what you are trying to say than words. 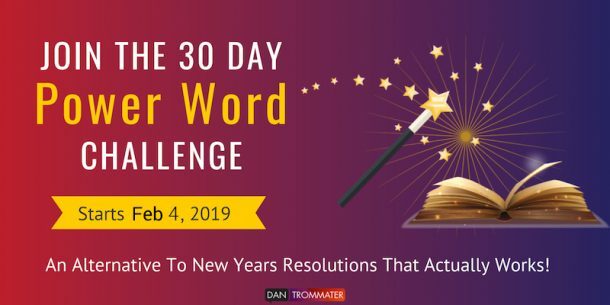 Belief Statement – share a controversial opinion to grab attention. Intriguing Structure – add drama by mapping out where your presentation is headed. Humor – laughter makes people more comfortable and focused. Rhetorical Question – gets the audience thinking and participating in their minds. Provocative Statement – a statement that will incite a major reaction. Shock/Surprise – piques your audience’s interest. A lot of speakers assume that just because they are at the front of the room, that people are going to trust what they have to say. It’s important to make people feel like they are in control. An imbalance of control creates resistance and discomfort. As a magician, I have to work hard to keep the crowd comfortable. Magic creates an inherent power imbalance because the magician knows something the audience doesn’t. Knowledge is power. When there is an imbalance of power, it has to be managed delicately otherwise people can feel taken advantage of. This can lead to losing an audience. This power imbalance is why some people don’t like magic. The don’t want to feel foolish or taken advantage of. Friction is created with the audience when people feel that the presenter is speaking down to them, setting them up to be laughed at or taking advantage of them (even if it’s unintentional). Until an audience trusts you, it’s “us and them”. The audience as a whole perceives themselves as “us”. The presenter is ‘them’ – not one of ‘us’ and therefore, not to be trusted (at least at first.) It’s up to you to break down the walls between ‘us’ and ‘them’ and create a unified whole comprised of both us and them. When I start my presentations, I don’t immediately jump into anything that would require someone to be vulnerable on stage. I work to establish trust with the entire audience through the use of open body language, smiling, using humour and being humble and self deprecating. When I do eventually ask for some help, I start small. I treat anyone who is willing to volunteer with respect and kindness. I’m a gracious host and generally make them look good. Not only is this just simple good manners, it also establishes good will with the audience. I do all of that so that when I do need a volunteer, it’s easy for me. I can get someone to come up to be trustworthy and work with me, instead of actively working against me to figure out the trick or trip me up. Don’t treat your volunteers like props. They have taken a risk to get up in front of their peers to help you. Take the time to acknowledge their help and connect with them as a person before simply using them to make a point. When you’re done with their help, be sure to give the volunteer credit and acknowledgement in front of the room. David Williamson, one of my favorite magicians, has a philosophy, “only give them 40%”. He means that if you let people underestimate you, they will be even more amazed when you over-deliver, making your performance more powerful. He does this by seeming to be just a little bit out of control of the situation. He fumbles a bit with the cards, he drops his magic wand. The audience thinks, “how can this guy be a magician, he can’t even control his props?” And that’s when the magic happens. The audience has lowered their expectations so much that when he actually delivers the magic (and it’s very strong magic indeed), they are blown away. It’s up to each of us to control how we are perceived and it’s a lot easier to live up to low expectations. By letting people underestimate you, you can then wow their socks off. Use self deprecating humour – by poking fun at yourself, you make yourself more relatable. Plan mistakes – build little ‘accidents’ into your presentation designed to elevate the audience and make you seem more human. Raise the audience’s status by showing empathy with their experiences. Body language is important for any speaker. You want to simultaneously ‘own the stage’ and be humble. That delicate balance comes with confidence and experience. If you pace restlessly, frantically gesticulate or stand stiff as a board, you’ll either distract the audience or lose their trust. And trust is the name of the game. Magicians know that there will be skeptics, even hostiles in a room. 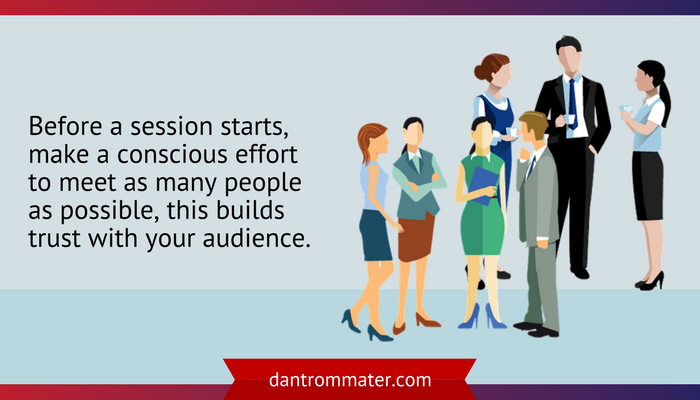 If you decide to focus your attention on these people during your presentation and try to win them over, you won’t enjoy your presentation, you’ll feel nervous and you may even look desperate. 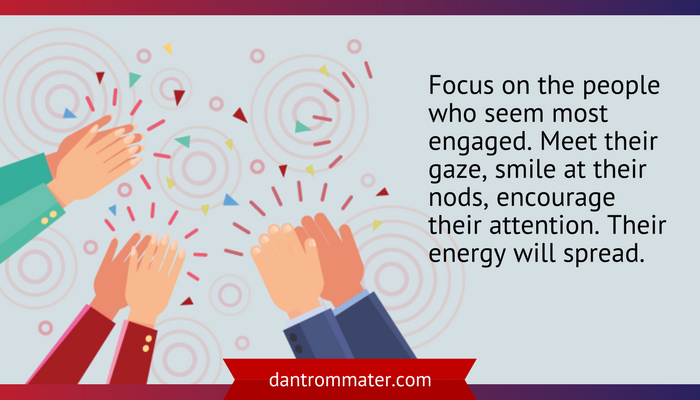 Focus on the people who seem most engaged with what you have to offer. Meet their gaze, smile at their nods, encourage their attention. Their energy will spread through the room. Maintaining eye contact and focus. Some speakers let mistakes fluster them. Magicians make mistakes work for them. How do you as the presenter deal with a mistake? If you treat it like no big deal, so will your audience. If you allow a mistake to derail you, the audience is going to feel like it was a bigger error than it really was. Don’t give mistakes anymore importance than they deserve. Mistakes happen. You’re human. Move on. Remember when you make mistakes, you actually seem more relatable. As a magician, when I make a visible mistake, I own it. I laugh at myself and call attention to it in a funny way, poking fun at myself. By calling an attention to the mistake, you disarm it. For example, you are talking to someone and you accidentally fly spit in their direction. Instead of pretending it didn’t happen, you own it. You call attention to it by laughing and saying something like “oh hey look it’s raining!”, or “with the light coming in, I thought I saw a rainbow.” Everyone will laugh and you’ll move on. And finally, this may be my best tip. Simply be grateful for the opportunity to share what you have to offer. One reason I love incorporating magic into my work is because of the wonder that people in my audiences experience. I get as much, if not more from the presentation than they do. If public speaking makes you nervous, look for the positives you get from the experience. Being grateful is one of the best ways to change your perspective and emotional state.